I'm in the middle of reading Marc Davis: Walt Disney's Renaissance Man which Adam bought me for Christmas. The book is divided into chapters based on where/what Marc was working on at the time. These chapters each have an appropriate author to the subject...Andreas Deja writing a chapter on Marc's Animal Studies for instance. The chapter I was most looking forward to was authored by Marty Sklar. The subject? Imagineering....obviously. 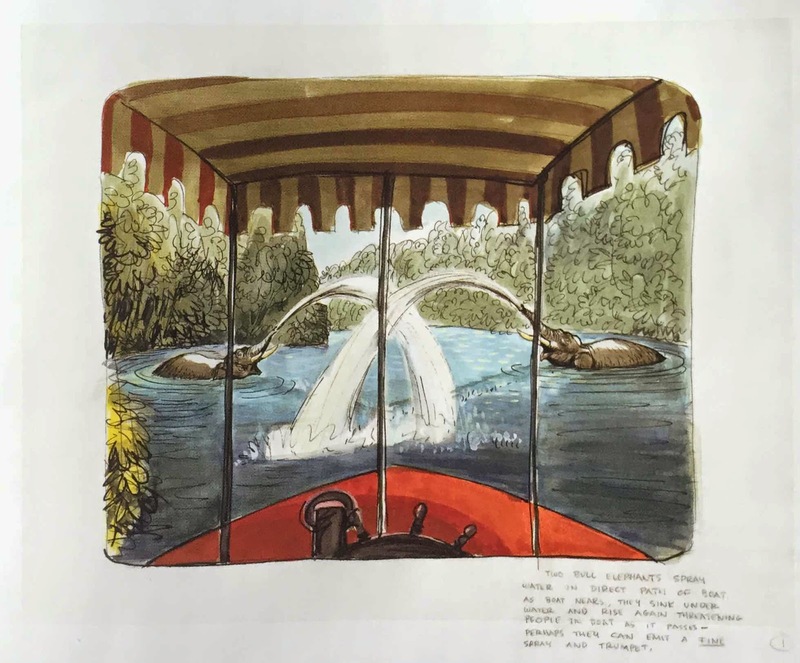 I know that anyone reading this blog is probably immensely familiar with Marc Davis's iconic concept art and illustrations during Disneyland's formative years. These images transcend concept art and have become part of the landscape of Disney history, just as the attractions that they inspired have. 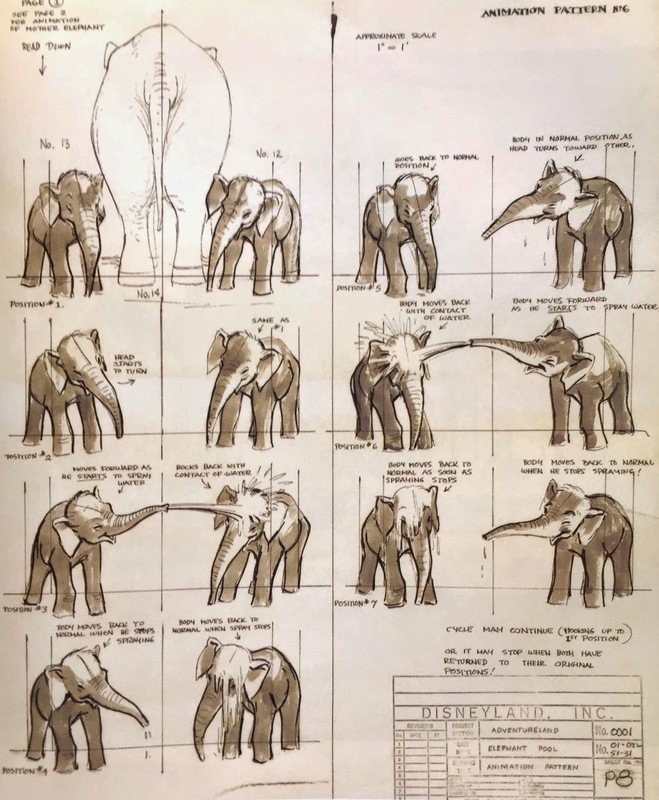 Here are three amazing images from the development of Disneyland's Jungle Cruise...specifically dealing with elephants. Enjoy. Who among us experienced "Jungle Cruisers" don't love that moment? There is inevitably a few newbies in the boat expecting to get splashed...usually women covering their giant teased hair. I love the look of terror that they get as they duck to avoid the drench. 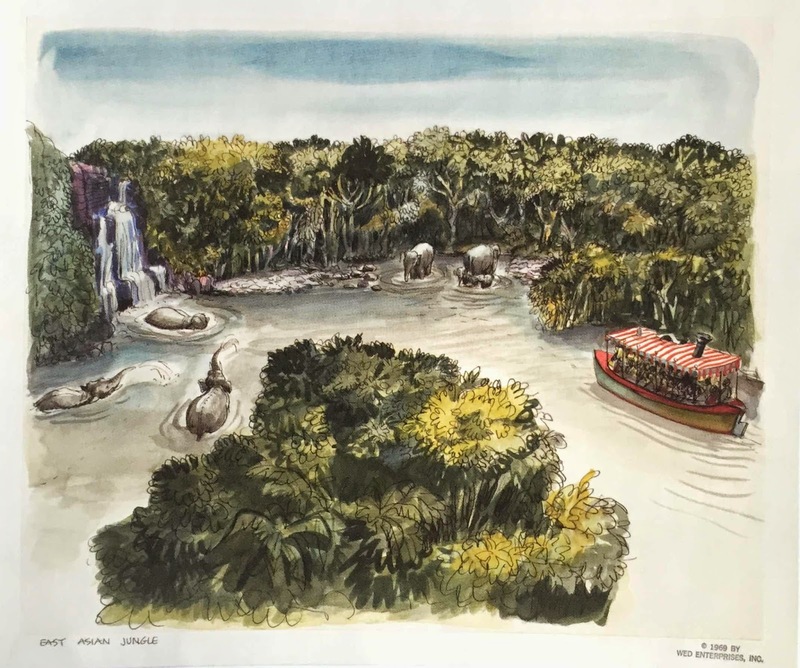 These beautiful illustrations really brought the scene to life and enforced the fun playfulness of The Jungle Cruise since day one. *Speaking of cruises! Adam and I are on the Disney Fantasy at the moment, and I'm determined to be completely detached from reality for seven days...so if our Twitter, Facebook, or Instagram are somewhat desolate right now...thats the reason. We WERE NOT MURDERED IN OUR SLEEP...I hope.